Virtual autopsies (yes, "virtopsies") are the newest in cause-of-death forensics. Robots surround a body, creating 3D imagery inside and out. When ready, the real body rests in peace while the stunt corpse gets chopped apart. Goodbye, CSI-induced nightmares! Basically the the virtopsy bot (yes, "Virtibot") manipulates and dots the body with markings in order to measure and take a bunch of stereo images with its array of cameras. While the external structure and markings of a body are being documented, a CT scan takes care of the innards. The final 3D image is created which pathologists then use and abuse without worrying about deforming a deceased body. 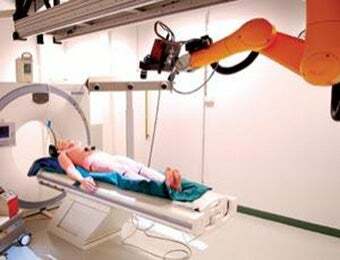 If need be, the Virtibot can use a needle to extract fluid or perform minimally intrusive biopsies.